This test instrument, used for a number of naval and military specifications, especially for cables, is used to determine a Toxicity Index of the products of combustion from small specimens of a material, in a closed chamber. The Test Chamber has a steel framework (to enhance its strength) and is constructed from fire retarded polypropylene plastic, with welded seams and a volume of 0.7 m3. The Door, which gives full access to the chamber for easy cleaning, is constructed from a clear polycarbonate plastic sheet, backed with a laminate, again to enhance strength and rigidity. The gas burner has a spark ignition system, which causes it to automatically re-ignite if the flame is extinguished. 15 sampling positions are provided for use with colorimetric Gas Reaction Tubes or, optionally, with specific Gas Analyzers. A separate Control Unit houses the Flowmeters, Timer, Methane and Air Controls. 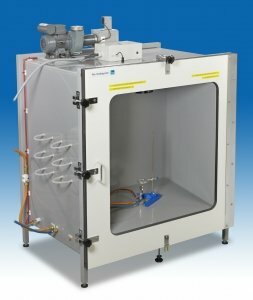 A forced-air extraction system is used for evacuating the Chamber after a test. An internally mounted Stirring Fan is used for rapid mixing of combustion products.